Pick-to-light systems are typically used in distribution centers to automate the order picking process. 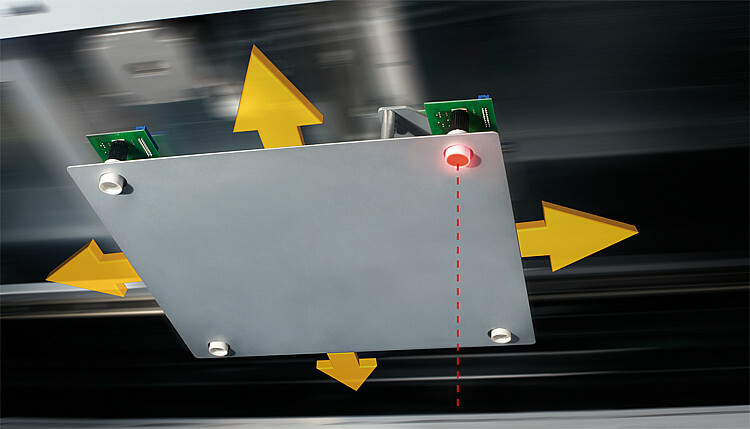 Pick-to-light systems are also used in manufacturing processes to help error-proof the assembly of goods. Put-to-light systems are similar to pick-to-light systems, however, they're used primarily to replenish stock in picking storage locations or to segregate picked orders by delivery location prior to shipping. 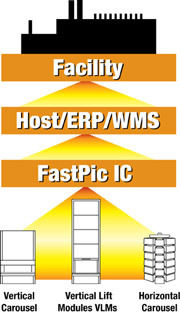 Pick-to-light and put-to-light systems are controlled by software tied to a customer's WMS or ERP system. The software directs and tracks the item selection or put-away progress of workers. When an operator completes a pick or put, an indicator at the next location shows when and where items should be picked or placed. 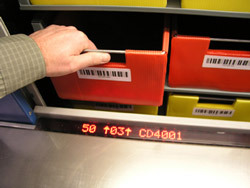 Pick-to-light and put-to-light systems incorporate a visual indicator adjacent to the storage location of the goods. Most system indicators also display the quantity of items to pick or put-away. The operator confirms they have completed the pick or put by pressing a button on the indicator panel. Many systems also have additional built in functions such as enabling the operator to register a "short pick" in the system software if not enough items are available or to call for workers to replenish depleted stock at a location. In some of the most sophisticated pick-to-light / put-to-light systems, infra-red sensors are incorporated to detect the worker's hand entering the correct storage location in order to further error-proof and streamline the pick-to-light or put-to-light process. Why Choose Integrated Systems Design for Your Pick-to-light / Put-to-light System? Integrated Systems Design has been integrating pick-to-light / put-to-light systems into customer facilities for years. We have the equipment and knowledge to tailor a system to virtually any need or application. Using these systems yields tighter control over your inventory, lowers item selection cost and reduces goods returns due to improper item selection and short picks. If your application warrants light directed picking, you'll find that the cost savings are significant and ongoing. Why not let us review your application and advise you on the most appropriate methods to select / replenish items for your operation. With decades of hands on design, installation, and manufacturing experience, few shelving companies have the expertise to match that of NationWide Shelving. We have installed thousands of shelving systems all over the nation. We understand the storage challenges you face, and have designers ready to create innovative solutions. NationWide Shelving offers Pick to Light Technology in Salt Lake City Utah. Pick to Light Technology can save you time, space and increase your productivity. The list of applications for Pick to Light Technology in Salt Lake City Utah is long. The short list includes Parts Storage, Open-Shelf File Shelving, and Industrial Warehouse Shelving. Pick-to-Light is a modern picking option. 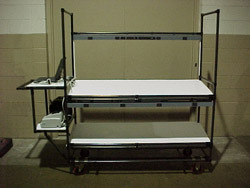 The component can be installed to your automated storage unit. The Pick-to-Light option with shine an LED light above the item the user is searching more. Hanel refers to this system as Pick-o-Light-Vario. This concept refers to the speed of how fast the user can find product. This picking option can dramatically increase productivity and save companies money. Pick and stop to light systems allows four employees to operate 12 Hanel Lean-Lifts at the same time, which is considered full capacity. It’s Error-Free in Salt Lake City, UT! The Pick-to-Light option is error-free for virtually any item, including the smallest container compartments. Some businesses rely on this picking option for placing order and can count on this system to be nearly error-free. Pick-to-Light is a great choice from disturbers that need to fill orders quickly. The Pick-to-Light system shines a light beam on the requested item. The employee places the item in the box, then clicks the button to confirm the pick and the next item to be picked will light up. The lift automatically goes back to its original position and delivers the next item to the retrieval bay. Pick to Light Technology allows us to deliver a product with quality second to no other. Since Nationwide Shelving is a top storage provider, we are able to keep our prices low, virtually beating any price for our products on the market today.